This is why I trained in Traditional Thai Massage at one of Thailand’s most respected Thai Massage Schools: WAT PO, I had the good fortune to find my way to a small branch of this famous school in Chiang Mai, where I received one-to-one attention for the majority of my entire training, a lot of the instruction I received was with the head teacher Somwang Khatchenniam, who has worked at Wat Po for 15 years in 2015; as well as Metawarin Bootdee and other long term teachers. The other head teacher, at this branch of the Wat Po school, Nui provided additional insight into Thai Element Theory which is traditionally taken into account in Thai Healing practices, about which I studied a 10 week program (It was so good that I took it twice!) with the incredibly knowledgable Nephyr Jacobsen who founded the Naga Center for Thai Massage in Portland after having herself lived in Thailand for several years and studied with (among others) one of the few remaining Ruesi (Thailand’s wise mystics who traditionally engaged in the healing arts and sciences and today are sadly known primarily only for their protective tattoo arts, while the knowledge of traditional regional medicines seems less in the public view). Since 2011/2012 I qualified in General Thai Massage & Advanced Thai Massage for Health, Thai Oil Massage, Thai Footmassage with Reflexology, Tok Sen and in 2014 ( 2016 the Thai Medicine Theory course with Nephyr Jacobsen at the Naga School for Thai Massage, to deepen my understanding. Adding to all this this several study and practice visits and most recently Thai Medical Theory study with Nephyr Jacobsen (director of the Naga Thai Massage school in Portland, USA) Advanced study with the Sunshine Network in Chiang Mai & Tok Sen at Wat Mahawan, a serene temple in Chiang Mai. + 200 hours Yoga training which I am continually building upon. To receive Traditional Thai Massage you leave your clothes on and lay on a mattress (or several blankets) on the ground. To describe the Traditional Thai Massage for that I practice: The training I received began with instructions to work along lines on the body referred to as Sen (which some say relates to energy, and it is accepted knowledge that sen are the lines on the body across which movement of any sort takes place. By applying pressure along specific pressure points and lines the free facilitation of movement is encouraged. Sen are responsible for all movement in the body. If Sen are blocked / obstructed then this can manifest in restricted movement of limbs, restricted blood-flow which brings with it a lack of nourishment to the cells of the body… some say that ‘energy’ is unable to pass through freely yet there are two dividing schools within Thai Massage which take approaches influenced more or less heavily by the Chinese medicine system and understanding inherent within it. Clear is this: our sense of wellbeing and potentially our health are affected if any movement in our body is restricted, blocked or simply sluggish. A massage treatment can help you kick start your system, encourage the expelling of toxins, sooth your nervous system which in turn may help your immune system greatly. After a Massage Treatment you may feel more aligned and likely more present in your body. I will work with single and double thumb pressure, palms, forearms and occasionally use my elbows, knees and feet to work with your body. Occasionally I may use a balm, some sesame oil or medicated oil to work on specific parts of your body (oftentimes the lower legs, the knees, sometimes on specific spots on your back, wherever the application may be of benefit). There are many nuanced treatment methods that can come up when you receive a treatment that is specifically for you. My next wish is to learn yet more about herbal applications, about the preparations and uses of medicated balms, liniments and teas to aid the healing processes of body systems that are out of balance. My Thai Massage Practice is about YOUR body and your limits. Thai Massage the way that I practice it is a participation experience, your input is often requested, throughout the thai massage treatment you will regularly be asked if the pressure as it is applied is right for you as only you truly know you. Thai Massage is not a SPA experience but a stepping stone to help you learn more about your body and how to take care of it optimally. You may leave the massage session feeling good, relaxed, energized or even sleepy. One can’t quite predict how you will receive the massage that day, and how release of tensions will affect you on the day and the day following your treatment. I strongly encourage clients to request regular sessions to help maintain optimal wellness and health, to build strength and regain mobility if it is partially lost. You will sometimes hear Traditional Thai Massage referred to as Nuad Boran, which is its Thai name. Thai Massage is a unique and powerful healing art that is an ancient and integral part of traditional Thai culture and medicine. Traditional Thai Massage is a wonderful experience for both giver and receiver as tight muscle tissue is released, blockages dissolve and movement restored to allow deep healing to occur in a space of presence and meditation. Some say that Thai massage blends elements of acupressure, Yoga, reflexology, meditation and Ayurveda. Upon some critical investigation and engagement with geographical history and the migration of people’s in the area, I found that this is a simplification and speaks more about the current fascination for fusion practices in the culinary as well as healing arts. True Thai Massage is not a fashion but a healing practice with a rich tradition rooted in the history of Thailand. 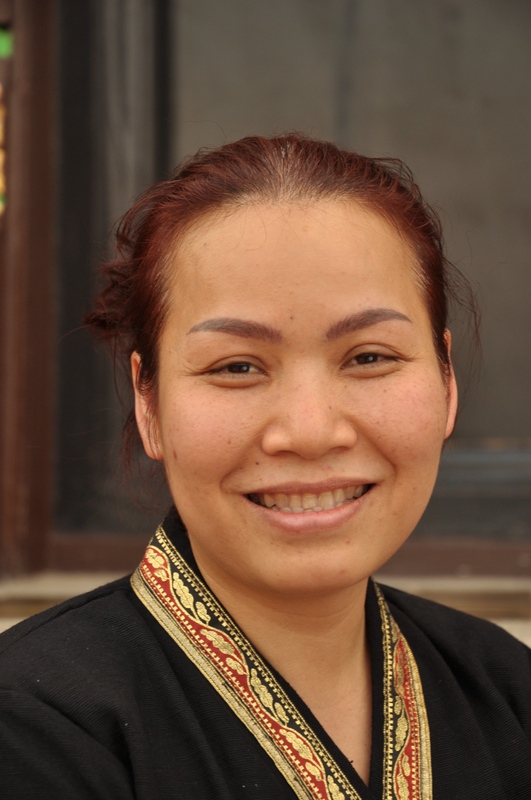 My teacher Nephyr Jacobsen refers to the Chinese and Indian influences upon Thai Healing Arts as perhaps the uncles or aunts but not the parents, which they are at times wrongly presented as. 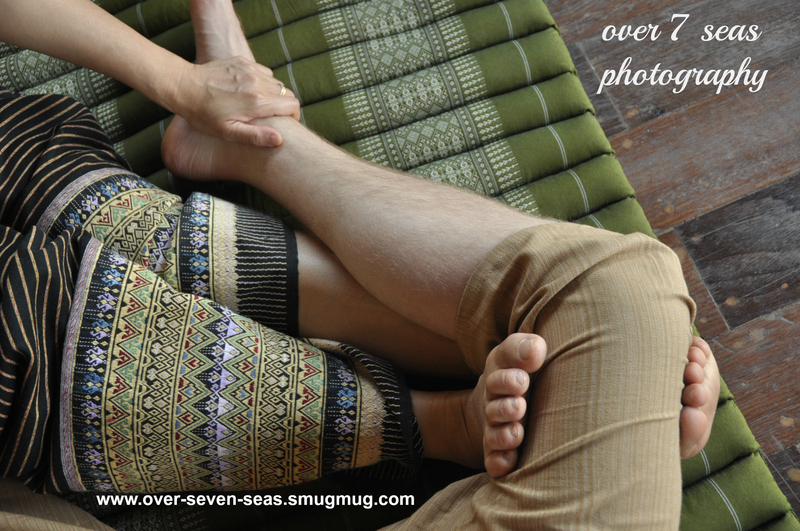 This image is from a photo session that I did for a Thai Massage colleague in Thailand. Demonstrating a technique regularly applied in Thai Massage.